SSC MTS Admit Card 2017 – SSC Multi Tasking Staff (Non-Technical) Online Exam Call Letter: SSC MTS 2016 Re-Exam Admit Card, Application Status goes available for download. Have you applied for SSC MTS exam? Now you can download your SSC MTS Admit Card for Multi Tasking (Non-Technical) Staff Online exam 2016 which has been scheduled to be conducted from 26th September to 26th October 2017. SSC MTS Re-Exam Admit Card goes available for download. Staff Selection Commission (SSC) is all set to conduct the its Multi Tasking (Non-Technical) Staff examination in 2017. SSC has issued MTS recruitment notification for 7000 plus Multi Tasking (Non-Technical) Staff vacancies for 2016 earlier this year. Good news for all SSC MTS applicant, Now you they can download your SSC MTS 2016 Admit card along with Application status online. Candidates who had applied for SSC MTS from any SSC Region can download their Admit card to check their eligibility to appear at the SSC MTS Online exam. Download Admit Card for the Recruitment to the post of Multi Tasking (Non Technical) Staff in different States and Union Territories, 2016 to be held from 16/09/2017 to 26/10/2017. SSC MTS (Multi Tasking Staff) exam will be conducted from 16th September to 26th October 2017. Written offline examination will be conducted in 2 Session in a day. SSC MTS exam will be of 120 minute for 200 questions. 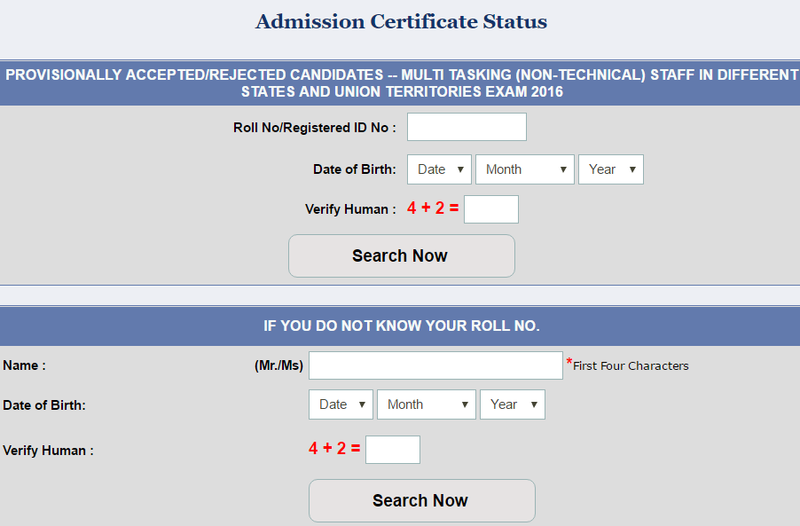 Admit card to the eligible candidates for SSC MTS Written examination is being provided. Here is quick guide on how to download SSC MTS Re-Exam Admit Card 2017. Follow the instructions given below to learn check your SSC MTS exam call letter. Log on to Respective SSC Regional Websites. Navigate to “MTS Application Status” Section. A new page will be open with “Your SSC MTS Admit Card". Candidates are hereby advised to keep visiting this page until they download their SSC MTS Re-Exam Admit Card, we will keep updating this page with more region SSC MTS 2016 Admit card. As SSC MTS Online exam date is announced, aspirants should be be ready for SSC MTS Online exam 2017.